The entire account by General Absalom Baird, of the Union Army, discussed the movement of the division he commanded; from the time it entered South Carolina in late January to when it arrived in Goldsboro, North Carolina in later March. The material that Baird wrote in his official report was quite bland, as it described the basic movement of his men throughout the South. The writing remained bland even when Baird wrote of when the Union Army reached Fayetteville, and “destroyed 2 iron foundries of some importance, 4 cotton factories, and the printing establishments of 3 rebel newspapers . . . . the old U.S. Arsenal and all the material in it.” The description, by Baird, of the destruction that Sherman’s men caused was very basic with no emotion, as it was just part of the war. His account differed greatly from the Confederates that described the events. As seen in Item 327, citizens in Fayetteville were passionate about the arsenal, as it was a symbol of pride for the community. Or in Item 174, in which E.J. Hale Jr. described the destruction that occurred to his father’s property and took nearly everything that he had owned. For Baird, though, there was not an attachment, and the destruction was just part of war. The image is of Absalom Baird. Absalom Baird, Report of Operations January 20-March 23, March 24, 1865, in The War of Rebellion: A Compilation of the Official Records of the Union and Confederate Armies; Series I, Vol. XLVII, Part I (Washington D.C.: Government Printing Office, 1895), 551.
. . . . March 1, division marched twelve miles to Ingrahamâ€™s Mills, near Hanging Rock; roads in terrible condition. March 2, passed Little Lynchâ€™s, Lick, and Flat Creeks, through almost impassable roads, and marched fifteen miles. March 3, crossing Lunchâ€™s and Mill Creeks, marched sixteen miles and encamped at Edgeworthâ€™s Mills; during the day harassed somewhat by rebel cavalry hanging on our flank and picking up foragers and stragglers. On the 4th crossed Johnsonâ€™s and Cedar Creeks; marched fifteen miles; crossed the State line at noon and encamped ten miles from Haileâ€™s Ferry. ON the 5th arrived at the Pedee, where the division remained in camp until noon of the 7th; then crossing the Pedee, marched ten miles on the Rockingham road and went into camp. March 8, reached Lumber River, having marched twenty miles through piney woods. March 9, crossed Lumber, marched twenty miles on the Fayetteville plank road, and encamped at Puppy Creek. ON the 10th made but three miles, encamped at Rockfish Creek-One brigade, Colonel Hunterâ€™s, having been sent forward two miles to Bone Creek to repair the bridge. Moving at 6 a.m. next morning, 11th, struck the rebel pickets at Beaver Creek, six miles from Fayetteville; drove them from their barricades, pushed on and entered the city at 9 a.m., recapturing and placing guards over the old U.S. Arsenal, basely surrendered by the traitors, Samuel S. Anderson, at the beginning of the rebellion. It contained a number of cannon and small-arms, together with valuable machinery for their manufacture. Have been directed to take command of the city and garrison it with my command the three brigades were at once posed in advantageous positions in the suburbs, and furnished guards not only for public buildings, but for nearly every private house. On our arrival I found the stragglers from all portions of the army who had pushed in with the advanced guard committing many disorders, but as soon as they could be cleared out good order was established, and maintained during our stay in the place. I remained in Fayetteville until the entire army had crossed the Cape Fear on the two pontoons we had laid down; and then, on the night of the 15th p, passed my own division over and took up the bridges. Before leaving the town I destroyed 2 iron foundries of some importance, 4 cotton factories, and the printing establishments of 3 rebel newspapers. At the same time Colonel Poe, chief engineer of the army, destroyed the Old U.S. Arsenal and all the material in it. 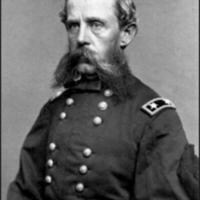 March 16, the trains of the entire corps having been placed in my charge, I marched with them on the direct to Falling Creek, whilst the other two divisions, unencumbered, and two divisions of the Twentieth Corps, marched upon a road some miles to our left, leading by Bentonville to Coxâ€™s Bridge. . . .
Absalom Baird , Absalom Baird, Report of Operations January 20-March 23, March 24, 1865, Civil War Era NC, accessed April 24, 2019, https://cwnc.omeka.chass.ncsu.edu/items/show/328.